Chuck must adjust to his new life as a business owner and being a spy without the Intersect in his head or the support of the CIA. Carmichael Industries’ first mission is a rich thief Jean Claude and a conning investor, Roger Bale, who has stolen money from some of the world’s most dangerous people. In the mean time Morgan helps Chuck with a special surprise for Sarah. Back in the Buy More, Jeff and Lester have taken things to another level with their latest scheme. Discuss the latest episode of Chuck here. Really enjoyed this episode! Still not a fan of Morgan but everything else was great Felt a lot better than most of S4. Feels "fresher". They've done well to set up a new dynamic, not just with Chuck without the Intersect but the Buy More/Castle etc. I wonder if we'll see General Beckman this season? Also good cliffhanger at the end there! Sorry for being so late to respond. Normally I'm on the ball here, but I've been away for like a week. - Morgan annoys me as the intersect. But I guess thats' the point. I may have missed it because I was passing out the first time I watched the episode, but did they establish how long they've been training him as the intersect. If so, he seems to have adapted to it a little better than Chuck (no emotional issues) yet still is very clumsy with it. - What happened to Morgan's girl and the whole not wanting him to be in danger thing by the way? - Season feels more like Season 1/2 for me...only one episode, so we'll see how it lasts. - PS: Loved the whole "dream house" thing. Sarah would want the white picket fence, wouldn't she? 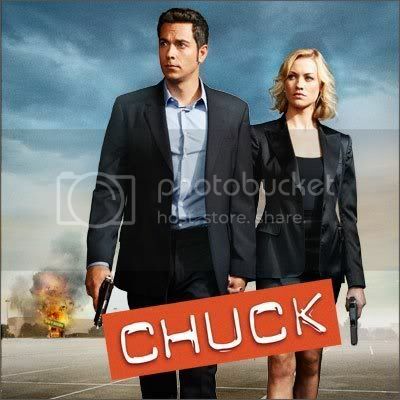 Do you think Chuck will get the intersect back? Also, will Morgan keep it?